Can you make a list of 13,000 words you know? This is the average vocabulary for 6 year-olds who are developing communication skills at a typical rate. However, for many children who are struggling with speech and communication skills, that vocabulary list is much shorter. Sue McCandlish, an Education and Speech Pathology professional, developed the model below that outlines how valuable listening is to the overall model of communication. She encourages teachers and parents to engage the “working memory” of children through listening games and activities. So why not get in the holiday mood and try some Thanksgiving listening games for kids? 1. Pumpkin Pie Clues – Give your child verbal clues to a food item you typically eat on Thanksgiving, without using the actual words that part of the name. For pumpkin pie your clues could include crust, orange, whipped topping, dessert. This game emphasizes listening for verbal clues, and you can make it as challenging (1 or 2 clues) as you need or give plenty of clues to increase opportunities for success. 2. 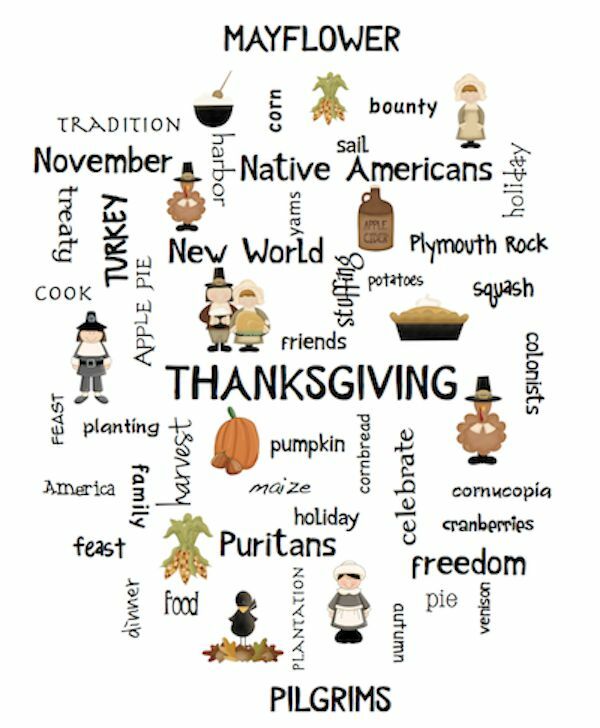 Thanksgiving Rhyme Time – Use this Thanksgiving word bank and take turns finding rhyming words with your child for each word on the list. If your child struggles significantly with speech, change up the game and you become the rhymer. Your child gives a Turkey Thumbs Up! if you say two words that rhyme. 3. Thanksgiving Sounds – Make a list with your child of all the sounds that remind her of Thanksgiving. Encourage her to listen for those sounds on that day and see which ones she can add to her list. 4. I’m Making Thanksgiving Dinner – Just like the classic game where you pack for Grandma’s and you take turns recalling what is included by each player, now play the game except with the theme of making Thanksgiving dinner. Another fun variation of this is Turkey on the Table – you just need a few more players for this one. 5. Duck, Duck, Turkey – Play the traditional game of Duck, Duck, Goose (or Duck, Duck, Grey Duck depending on where you live in the country), and swap out Goose for Turkey. 6. Farmer in the Dark – This is a combination of tag and pin the tail on the donkey. Place a blindfold on either you or your child – that person is the farmer lost in the dark who is searching for his prized turkey. All of the other players move around the farmer and say “Gobble, Gobble!”; the only clue the farmer has is the sound of the turkeys calling. This game works best played outside, but if you have the room it works inside, too (we then play by “walking” on our knees – you move at much slower paces and there is less tripping). We also add in the “no running” rule for the turkeys and designate a play zone in which everyone needs to remain. 7. Story Time Repeat – Read a Thanksgiving related story to your child or have him watch one of these online, then ask questions about the story. This reinforces listening skills, but also encourages kids to use the important skill of responding (the other necessary part of the listening quadrant shown above). Listening sets a foundation for speech, literacy, and writing. These Thanksgiving listening games for kids are just a few ways you can incorporate language-building activities into your daily routines with your kids and keep working on those foundations for communication.